Here we go again. Monday fun day. Anyhow, all is well that ends well and this week my husband ( who also the official sponsor of the above mentioned shopping spree ) decided we should write a list about food. I rewarded him with the opportunity to write his own and have it published while I shoe shop. So this list is entirely brought to you by my spousal unit. Next week 10 ‘OH NO YOU DIDN’T’ MOMENTS. Let’s make each other laugh! Make a list, check it twice, link it up. Read others. Have fun! Zero (before the #1) Brinner (breakfast at dinner time)! 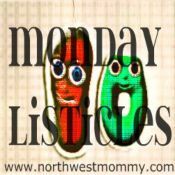 This entry was posted in Monday Listicles and tagged favorite meals, Husband, Linky, monday listicles. Um, I will take the poached eggs with caramelized pancetta for Brinner please! Pork Chops and mashed potatoes is a favourite here too! I love grilled salmon also.. haven’t got around to make my own pasta sauce as yet.. something which I have on my to try out list. I am intrigued by the Colombian chicken potato soup! so many yummies….pork chops, grilled salmon, raviolis, pizza… this darn listicles is making me hungry Stasha. This is a great list this week. Thanks once again for being such a gracious host. Of course, you know I love this Monday’s List! Have a great day! Oh yeah, I love homemade pasta, homemade pasta sauce, and homemade meatballs! Yum! I also shared pizza from a local restaurant on my list too. Now, I am really hungry! The only thing better than homemade lasagna is homemade lasagna the next day! Yum! I don’t see anything on that list that I don’t like (and brinner rocks!). I actually put maple syrup on my Yorkshire pudding. Totally not right, but it’s delicious. Brinner is a highly popular meal around here! And it sounds like the husband really likes Italian food. But Stasha, I still want to know what your favorite meal is! just JENNIFER recently posted..700 Posts Later…. Yum. This made me so hungry. I do so much more cooking in the fall/winter because it is so much more fun to be around a hot stove than when it is 80 degrees.. Right now my favorite dinner is cold fried chicken from the deli with some grape tomatoes and corn on the cob. Anne LeBlanc recently posted..Camping on the coast… A post in photos. These are some fantastic meals… love them all, especially breakfast for dinner which I may do one night this week as a little treat before the kids head back to school. We looked into doing our school supply shopping online but decided against it after doing a little price comparison and unfortunately, Amazon’s prices were quite high. What a great topic – thanks for hosting! Have to agree with pizza from the local shop – always good. And a Sunday roast is one of my all-time favorites. My list is almost entirely pasta so I certainly love a couple items on yours – though yours has much more variety than mine What’s your pasta sauce like? You’re right that the sauce makes the pasta. I’m loving the grilled Salmon!! Now I need your Colombian chicken potato soup recipe. Seriously need!! I just returned (last night after a 16 hr drive) from Coastal Oregon. Even though we had epic weather, this soup would have been perfect for our stay. We’ll try it during our fall (if you could call it that) down here. We love Brinner – that’s usually our go to “fast food”!